" The Carmel is a lovely little river. It isn't very long but in its course it has everything a river should have. " Community is cultivated at the intersection of art and our natural environment. Read about our project below and support us as we enhance the Carmel River Community! Thank you for your support Secretary John Laird! 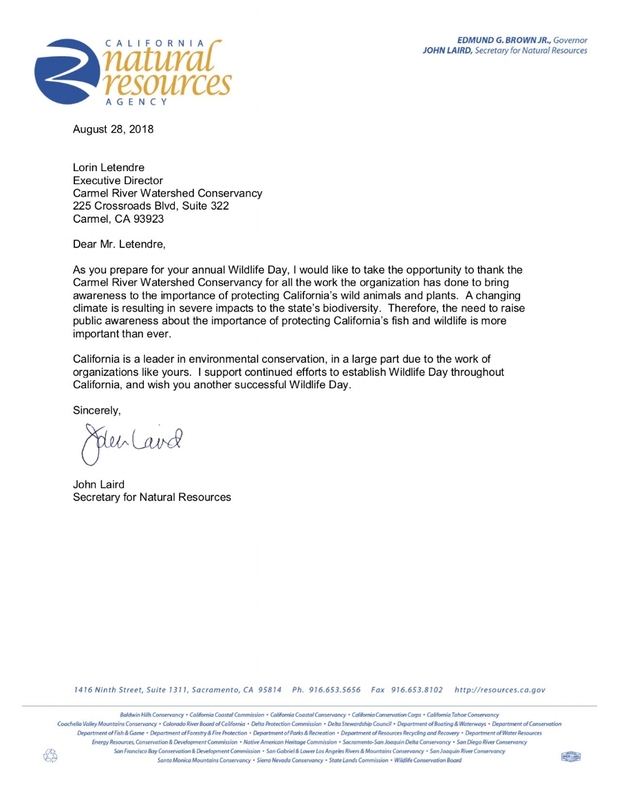 In August 2018, John Laird, Secretary for the California Natural Resources Agency, wrote a letter of support to Lorin Letendre, our Executive Director, for the work Carmel River Watershed Conservancy does to protect the wildlife of California. Find out about our organization, mission, and the achievements of our advocacy. Find out about our most recent projects in our updated 2018 Active Projects Report.